Farro Salad: Perfect for Entertaining, Perfect for Family Meals, and Perfect the Next Day! When I made this on the Today Show, I explained how it’s a great stand-in for the ubiquitous pasta salad. But it’s so much more! Farro is a slow-burning carb and as such is super good for you. Even better, it’s satisfying to eat, with a seductive bite and a mild nuttiness that marries with just about any vegetable, fruit, and/or nut mixture you can think of. Here I mix it with asparagus and corn, as well as scallions and chives. If you feel corn should never be without its soulmate in the summertime, toss in a half pint of halved cherry tomatoes or one or two chopped larger ones. The lemon vinaigrette livens things up considerably — and, by the way, the vinaigrette is fab on green salads, too. Two of my kids totally love this salad and I’m right with them. It’s so versatile and glorious, I make it for just about every family gathering we have, especially in the summer. While you could whip this up shortly before serving, there are ways to prep it ahead of time. Make the vinaigrette up to a week ahead of time and refrigerate it (hide it from the salad lovers in the family so it will be there when you need it!). Both the farro and asparagus can be cooked the day before or the morning of the party and held in the fridge. Grill the corn a few hours before you need it or even a day ahead. Scrape the kernels from the cobs and keep them in a covered container. When it’s time to eat, gather the ingredients and toss well. Farro is one of those grains that you try once and come back to again and again, wondering why you waited so long to work it into your family’s repertoire. It’s a type of wheat, very like spelt but not exactly (although in most recipes one can substitute for the other), with a pleasing nutty bite. Pair it with vegetables—those I have selected here or any of your choosing—and it makes a summer salad that could serve as a side salad or main course. In a saucepan, bring 4 cups of water and the farro to a boil over medium-high heat. Lower the heat and simmer for about 25 minutes or until the farro is tender. Adjust the heat to maintain the simmer. Drain well. Meanwhile, preheat a gas or charcoal grill to medium-high heat. the top and then cut the remaining stalk into 1⁄4-inch-thick pieces. Reduce the grill heat to medium-low and grill the corn for 5 to 6 minutes, turning to char each side lightly and cook the kernels. Set aside to cool. When cool enough, cut the kernels from the corn cobs. Discard the cobs. 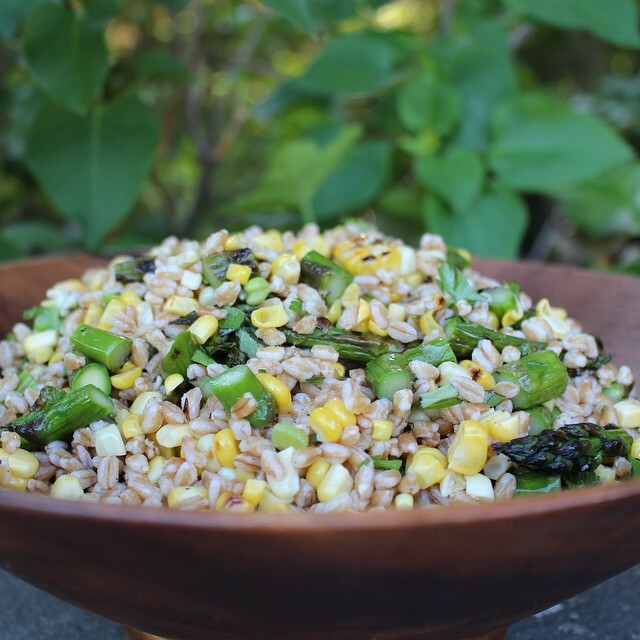 In a large mixing bowl, mix together the farro, scallions, corn, asparagus, and chives. Toss with enough of the vinaigrette to moisten the salad. Season with salt and pepper and serve.